Checking the site’s stats this week, I was bemused to find that some poor soul ended up here after asking their search engine to make a value judgement on the relative attractiveness of pocket-sized Scottish actress Shirley Henderson. 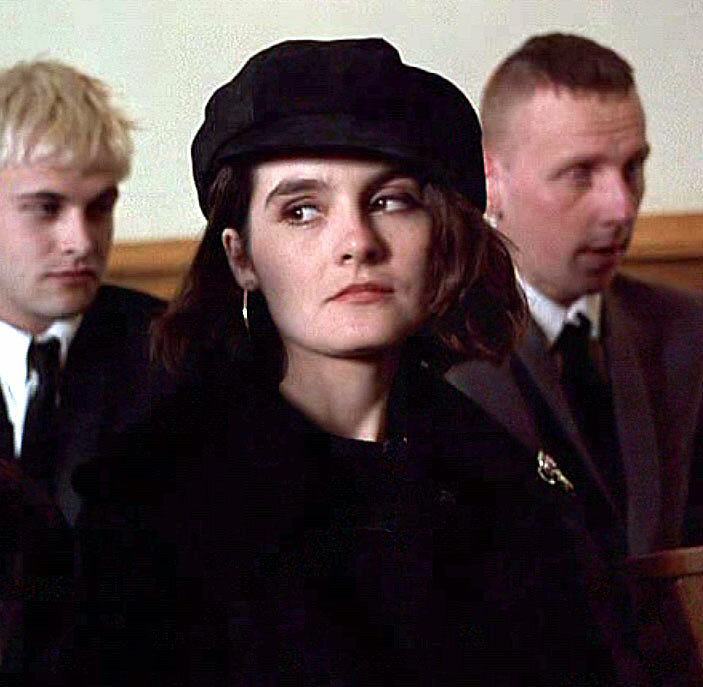 So, in the interests of public service, let me definitively answer the question, “Is Shirley Henderson ugly?” No. No, she is not. She’s actually very pretty, with a compelling screen presence, and oodles of offbeat charm. Glad we got that settled. Meanwhile, I was scouring the charity shops and discovered “The Green Edition” of Trainspotting (1996) on VHS tape. Yay! For no apparent reason the most recent DVD release of this film fails to include the deleted scenes… or any of the other special features from the now-deleted “Definitive Edition” DVD… meaning that a second-hand video that I bought for 50p is actually superior to the shiny disc currently on sale in the proper shops! Wacky. The scenes themselves are quite depressing, dealing as they do with amputation and pimping… but I’m glad I finally got to see them, in all their patchy, grainy glory. It’s also great to re-watch the “railway track” trailer, which is a little self-contained nugget of genius. I didn’t actually watch the film itself, because… well, it’s quite a heavy experience, and I’m not really in the mood for that right now. I’ll probably end up getting a copy of the previous DVD version off eBay sometime, though… because it is a classic. Trainspotting came out while I was still an impressionable Media student, just starting to wrap his head around the craft of Cinema… so it holds a special place in my heart, alongside Reservoir Dogs, as a film that made me excited about the art form. It remains a seminal work for me, and the character of ‘Begbie’ (played to chilling effect by Robert Carlyle) remains one of the silver screen’s scariest villains… precisely because he could be lurking in any pub or alleyway, on any given night… pint-glass in hand, and a sociopathic smirk skewing his moustache. Shudder. I didn’t read the novel until many years later, but also found it very… well, I can’t say “enjoyable”, as such, because there’s a story in there (‘Bad Blood’), that is by far the most disturbing thing I have ever encountered in my life. But there are also moments of great humour, and grimly engaging and evocative writing, so I’d heartily recommend it to those with a strong stomach, and a high tolerance for (occasionally impenetrable) vernacular prose. D’ya ken? Weirdly, the book is so stuffed with stories, you could probably get a whole other film out of it, without ever really stepping on Danny Boyle’s toes. And, heck, one of them even has a cute Goth-y cousin of Renton’s in it, so I’d be first in line to buy a ticket. While I was rewinding the tape it occurred to me that, thanks to Boyle and Annie Griffin, most of my favourite “British” movies are actually Scottish in origin (does The Wicker Man count? It is set on a Scottish island, after all)… and that most of my fave “British” comedy actresses hail from Scotland as well. I have no real explanation for that… but maybe I should start eating more shortbread, just in case…? This entry was posted in Rants about Films and tagged Annie Griffin, Begbie, Danny Boyle, Gail, Irvine Welsh, Robert Carlyle, Shirley Henderson, Trainspotting. Bookmark the permalink.